Yesterday in Santa Clara County, 21 people were arrested for DUI. In 2013, 18 people were arrested for DUI during the same time period. Remember to always designate a sober driver and if you have been drinking, do not drive! 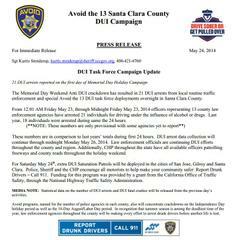 Deputies and officers from all 13 Santa Clara County Law Enforcement agencies will be focusing on DUI enforcement all weekend long.